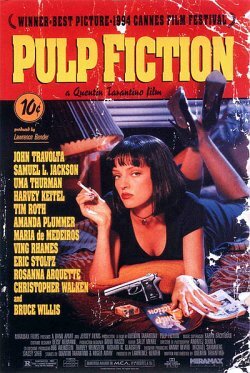 Starring a cast including John Travolta, Samuel L. Jackson, Uma Thurman, and Bruce Willis, this Quentin Tarantino crime film tells the somewhat inter-related stories of these four main characters. Travolta and Jackson are a pair of hit men who have several adventures having to do with retrieving a briefcase, disposing of a dead body, and eating breakfast at a diner. Separately, Travolta has a somewhat harrowing outing watching the wife of his boss (Thurman). Willis on the other hand does not throw the boxing match he was suppose to. Thus, he finds himself in hiding with his lover, facing his own set of problems. I do have to say this film was interesting because of the nonlinear format almost like chapters. The eclectic pop culture references were classic along with some of the dialogue. However, it gets tiring listening to the strong language and a scene or two are worth skipping in my mind. This entry was posted in 1990s, Comedy, Crime, Drama and tagged AFI, Bruce WIllis, John Travolta, Quentin Tarantino, Samuel L. Jackson, See Before You Die by 4StarFilmFan. Bookmark the permalink.